For Finches, Canaries, Parakeets, Doves, Parrotlets, Lovebirds, Cockatiels and other little beaks. 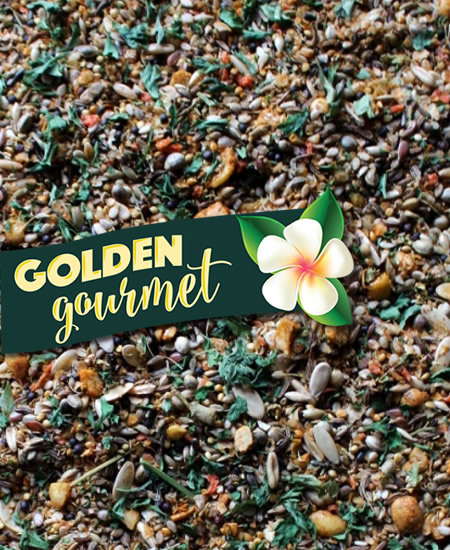 Includes freeze-dried & dehydrated fruits, herbs, spices & vegetable, plus grains, hemp seed and so much more. Chock full Ingredients Granulated To Beak perfection. Fruits and Ingredients are dehydrated unless otherwise noted. Fortified with Natural Bee Pollen - nature's miracle supplement! Does Not Contain Peanuts. Pros: I've never seen Sherbie SO enthralled with his food before. I give this to him as a bedtime snack. Normal snacks he'll come and go to... this one he can't leave alone! Comments: Thank you for offering a delightful and healthier alternative to millet and similar "junk" foods. 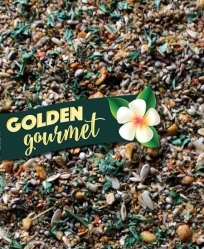 Notify me when Golden Gourmet A Taste of Australia Per Pound is in stock.